This is a situation where the German language -- not French, nor Italian and certainly not English, really captures the feeling and nuance of a work of art most eloquently. Physikalische Typografie* means "Typography of Physics." An Alphabet of Physics Diagrams? Creatively Capturing Fonts with Physics- truly awful! 26 Physical Letters- not too bad. This post is about physics-student-turned artist MunnaOnTheRun, and the story of his rather abrupt transition to artiste and graphic designer. The catalyst for his transformation was quite literally the Unified Field Theory of Physics. MunnaOnTheRun, and Wikipedia, refer to it as The Theory of Everything. It is (a yet to be proven theory) linking all known physical phenomena. Albert Einstein was intent on tracking it down in the last decade of his life. MunnaOnTheRun was an enthusiastic student. Unfortunately he was also a miserable failure in physical science coursework, by his own admission. Now, fast forward in time. 2005 was designated World Year of Physics in commemoration of Einstein's Theory of Relativity centennial. 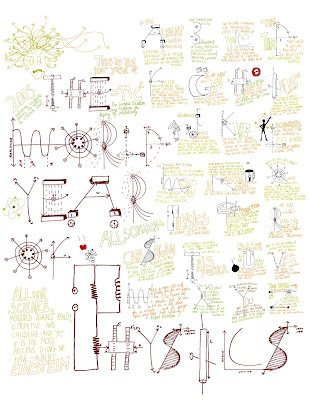 MunnaOnTheRun wanted to create a typeface from physics diagrams for the event. After months of research... I finally got hold of 26 diagrams that looked liked the letters of the alphabet. This poster literally transported me into a parallel universe. I sent this around to graphic designers .... With no formal training in art, and nothing to show for except badly drawn doodles, I started believing that I could make art. Physics changed everything for me. * The website ILoveGraffiti coined that pithy phrase, Physikalische Typografie.